Heart-Pounding Excitement As Jolting As An Electric Shock! Topwater lures provide Bass Bums™ the most visual, most impressive and most exhilarating bass fishing and catching experience we can have. If your heart doesn't pound and your breathing quicken when a bass viciously blows up on your surface lure then... well, then you need to see a doctor. I worry about your heart! 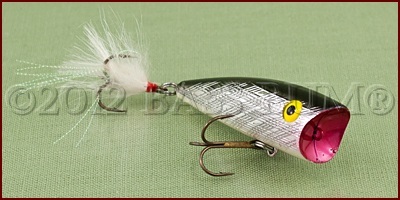 Topwater lures are truly "big bass" catchers that can be fished any time of day almost year round. The only exception is when water temperature is below 50´ but I've seen bass caught on topwater lures in 40´ water. So never say never. They are primarily shallow water lures but they're also very effective at "drawing up" bass suspended over deep water. They are also excellent for fishing rivers and streams. 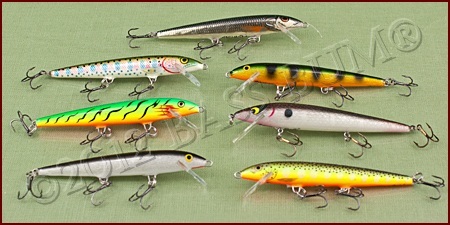 Topwater lures are many, with different shapes, sounds and angler imparted actions. 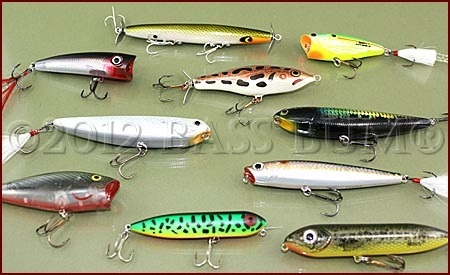 They can be categorized into the following: buzzbaits, chuggers/poppers, floating minnows, stickbaits, prop baits, frogs (slop baits), crawlers and spoons. Let's take a closer look at topwater lures categories. Buzzbaits are the noisiest of the top water fishing lures squeaking or clacking while throwing up water as they gurgle across the water's surface. 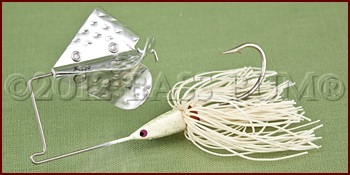 All buzzbaits have at least one double-winged aluminum blade while some have two. Some have "clackers", some don't and some have holes in their blades while others don't. There are even some triple-winged versions on the market like the Strike King Tri-Wing Buzz, as well as models with two double blade, counter rotating versions like the Strike King "Double Take" buzzbait blow. And you thought buzzbaits were the same. Not so my friend. A buzzbait also works well as a search bait. It allows you to work water quickly often drawing strikes from larger than average bass. After locating them with a buzzbait you can follow up with plastics or jigs. With most models the blades turn on a safety-pin style shaft just like you find with spinnerbaits. Their design makes them quite snag-free as the shaft upon which is affixed the blade is in front of the hook. Buzzbaits will accommodate trailer hooks (try a treble hook sometime) and plastic or pork trailers. The trailers help with a buzzbait's buoyancy. Chuggers, and their close relative Poppers, are topwater lures with concave faces which create a glurp-glurp (some say popping, sound when retrieved. Many models have rubber or feather dressed rear treble hooks. Some have grooved or flattened faces instead of concave ones. These topwater lures are "pinpoint" cast lures. They're intended for fishing precise targets like openings in weeds, grass or lily pads. Casting them into these openings or under overhanging tree limbs and brush can be very effective. Some of the best come from Storm fishing lures, like the Storm Chug Bug above and from Rebel fishing lures the Rebel Pop R at right. Floating Minnows and Jerkbaits, or what are sometimes called "twitch baits", are slender, realistic imitations of minnows like shiners or shad. They're usually made out of either balsa, like the Rapala Original Floating Minnow, or plastic with either a small lip or no lip at all. The slim design of these topwater lures appeals to bass as a meal that would be easy to swallow without the danger of lodging in their throats. This visual perception of minnow baits by bass, which are first and foremost sight feeders, may account for the greater success of these lures in clear water over stained or dark water. 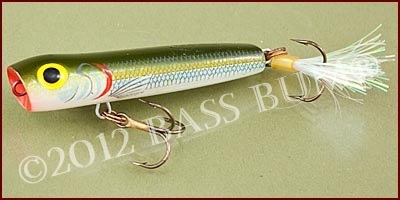 Unlike all other topwater lures, minnow lures can be fished "on top" or below the surface. Many have short bills and will be taken down 1-3´ when steadily retrieved. Once stopped, if they are "floating" models, they begin to rise to the surface. Note that if they are "suspending" models rather than surface floaters, they can be retrieved as deep as eight feet and do not float to the surface when paused. That's why their called, "suspending", who would've guessed? When retrieved slowly and steadily on the surface a subtle, very lifelike wobble is imparted to these top water lures. They are in effect "wake baits" with this retrieve. The light weight of balsa models, like the Rapala Original Floating Minnow, makes them difficult to cast, with other than light spinning gear. It also makes them difficult to fish with a traditional, aggressive stop-and-go retrieve. When pulled forward with sharp rod movements, jerks if you will, balsa models will dive down about a foot but quickly rise to the surface again. Using a slight "twitch" of the rod tip, instead of an aggressive jerk, and allowing the lure to sit still between twitches, is a more effective technique in my opinion, especially for spring smallmouth. A twitch and reel retrieve also works well. Use a snap or loop knot with these lures. Tying directly to the nose ring will hamper your ability to impart lifelike action to them. Stickbaits, or what some call "surface darters", are generally thicker and heavier than minnow baits. Most have hollow bodies with internal weights either to create noise or cause the head to float "up" at rest. If the head rides higher in the water than the tail the side-to-side movement known as "walking-the-dog" is more easily accomplished. When worked they have a wide, side-to-side sliding movement much different than the subtle wobble of minnow baits. When retrieved these lures don't throw water like other top water lures, such as chuggers or buzzbaits, so they perform better in calm water where their smooth side-to-side glide attracts the attention of bass as deep as 20 feet. This category requires a bit of practice in order to develop the "walk-the-dog" movement when retrieved. The pack leaders in this topwater lure category, as far as I'm concerned, are the Heddon Zara Spook (above) and the Lucky Craft Sammy below. I downsize these when targeting smallmouth using the 3" Zara Puppy and the Sammy 85 or 100 while staying with the 4 1/2" Spook and Sammy 115 when going after largemouth. But being the junk fisherman I am there are many other lures that I fish in this category which are bass catchers and just darn fun to fish as well. It's a part of the "fishing" in "fishing and catching. Prop Baits look "clunky" to me. They have propellers on at least one end, often both, and have two or three treble hooks. I can't imagine why a bass would take what appears to me to be a mass of metal. But if you're going after bass where you want a lure to draw attention to itself, such as in choppy water, fishing the "jumps" or during rain (leave me out of that one), a prop bait is a good choice. These topwater lures have blades (propellers) that have a pitch or twist design that cause them to spin as they travel across the water's surface. They generate a gurgling sound as they churn the water during retrieve. They're really great fun to fish. Fish prop baits with a twitch-and-pause retrieve. You can adjust the way prop baits work by altering the angle of the props. Bend them forward and you reduce the distance the lure moves when twitched as there is more water resistance. Bend the blades backward and you get the opposite effect. The lure will travel further with each pull. Tie your line directly to the lure's nose ring, no snaps. Frog Lures are sometimes hollow, sometimes solid plastic. They originated as "slop baits" to be used as topwater lures in hot weather when the sun is high, the water calm and the bass retreat to the shade of grass, weeds and lily pads. Popular frogs, such as those from Snag Proof and Scum Frog, have hollow bodies and rubber strands that resemble moving legs as the frog is retrieved. With a hollow body a frog will float over the top of dense grass, like milfoil or hydrilla, lily pads or any other type of surface emergent vegetation. Hollow style frogs have built in upturned hooks. Other frogs, like the Horny Toad, Sizmic Frog and Yum Buzz Frog are solid plastic and are Texas rigged with 4/0 or 5/0 wide gap hooks. Frog fishing requires focus, skill and steady nerves. "Soft Plastic Topwaters" are really soft jerkbaits "fished on top". Rig the soft jerkbaits, which usually have slits in their bellies, with a 3/0 or 4/0 wide gap hook. Fish them with a "twitching" retrieve. I suggest you also place a swivel above the hook in order to reduce line twist and to add a little more weight to help casting. "Floating Worms" are simple and extremely effective topwater lures. The worms used are usually 7" straight tail versions in bright colors like these Zoom "Trick Worms". The colors are really for the benefit of the angler, nor the bass. The bright color enables the angler to see the worm as it is worked and when a bass takes it. Casting to cover and deftly twitching the worm while keeping it on the surface or just under it as you retrieve it will catch in spring as well as anything. Stick style worms like the Senko are also used though their weight causes a more rapid fall. I find them less effective as a surface bait than Trick Worms.